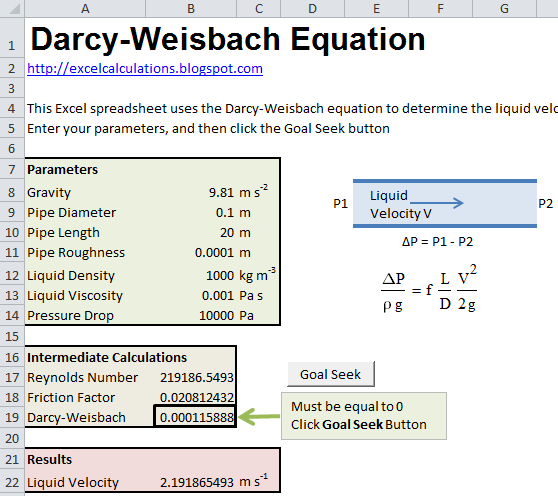 This Excel spreadsheet uses the Darcy-Weisbach equation to calculate liquid velocity in a pipe. The Darcy-Weisbach equation describes the relationship between the pressure loss and liquid velocity in a pipe. This is the equation employed in the spreadsheet. For laminar flow (Re<2000), the friction factor f is 64/Re (where Re is the Reynolds Number). Ror turbulent flow the friction factor is given by the Haaland equation (although the Colebrook equation can be used instead). The calculation is iterative, and requires the use of Excel's Goal Seek. However, this is automated in the spreadsheet so you only have to click a button and some VBA initiates Goal Seek for you. The Darcy-Weisbach equation should only be used for steady-state incompressible flow. It can also be used for open-channel flows by replacing the diameter with the 4 R, where R is the hydraulic diameter. The hydraulic diameter is simply the cross-sectional area divided by the wetted perimeter.